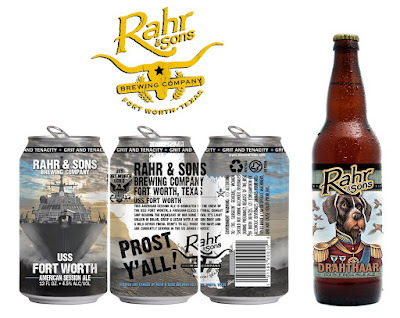 Rahr & Sons has announced it will release two new beers in the month of August, one named after a member of the family, and the other inspired by a ship named after the Fort. The first of these will be Drahthaar, a double IPA "with a bold, malty flavor and a crisp aroma that includes notes of citrus, pine and grapefruit." Referencing a certain breed of German hunting dog, this beer is named in honor of the family's own drahthaar, Schnapps. To be sold on draft and in 22-ounce bombers, Drahthaar will begin appearing at draft and retail accounts during the first week of August. Later in the month, Rahr & Sons will debut U.S.S. Fort Worth. This American session ale is dedicated to the crew of the U.S.S. Fort Worth, a Freedom class littoral (close to shore) combat ship that was commissioned by the U.S. Navy in August 2012. Described as "crisp and clean with a medium body and a mild citrus finish," a portion of the proceeds from sales of the beer will be donated to the U.S.S. Fort Worth Support Committee. This organization provides moral support and appreciation for the ship's crew and families. Available on draft and in 12-ounce cans, U.S.S. Fort Worth will be released during the last week of August leading up to Labor Day. Commenting on U.S.S. Fort Worth, brewery owner Fritz Rahr said, "I am proud to live and work in the City of Fort Worth, and it is an honor to have our city's name on such a prestigious naval ship with a first-class crew. We wanted to recognize the brave men and women of the U.S.S. Fort Worth, as well as the other armed forces members with this special brew." Drahthaar will be featured during the brewery's Wednesday tour on August 5, from 5-7:30 p.m.
U.S.S. Fort Worth will be featured during the brewery's Saturday tour on September 5, from 1-3 p.m. Members of the U.S. Navy will be on hand to help celebrate the occasion. Admission is $10 per person, and all who attend will receive a commemorative pint glass. Labels: Fort Worth, new beers, press release, Rahr & Sons Brewing Co.